We know you’re busy; That’s why we give you plenty of notice when we hold events. 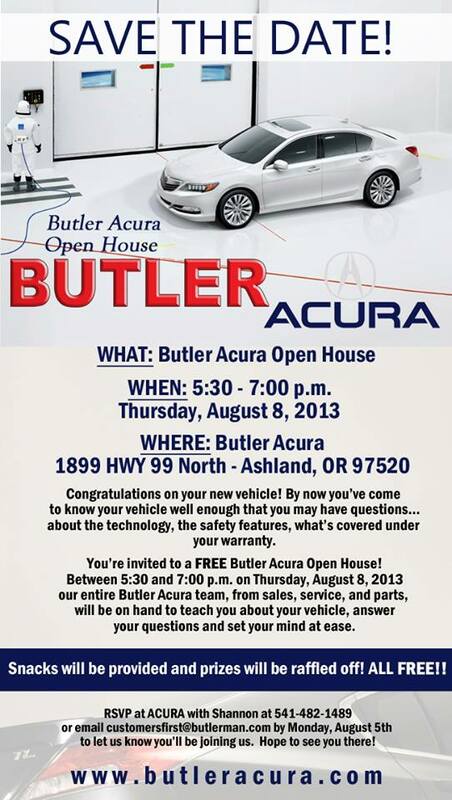 So, consider this your last heads-up before our Ford and Acura Owner’s Open House this Thursday, August 8th, 2013. If you don’t know what our complimentary Open House events are about you can read more here. We promise, they’re fun! And there’s absolutely no selling going on… unless, of course, you want to buy! Join us! Our entire Ford and Acura staff will be on hand to answer any questions you may have, teach you about your vehicle, it’s safety features, technology, and warranty, or just to sit and chat, if that’s more your style. We’ll even take you back in the shop to show where your vehicle’s serviced. And because it’s an informal affair, we’re open to other suggestions, as well. A light dinner will be provided so bring your appetite. All you have to do to get on the list is call us at (541) 482-2521 and ask for Shannon, or drop us an email at customersfirst@butlerman.com. See you Thursday!